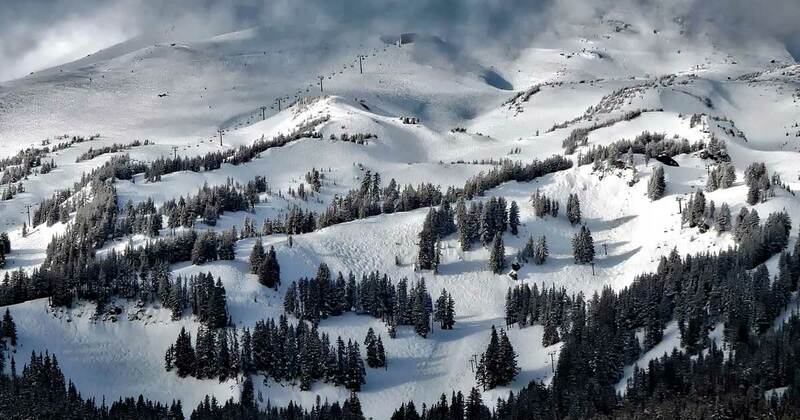 Oregon is famous for the ski slopes found around the state, and if you are planning a ski vacation, you should definitely consider Timberline Lodge, located near Mt. Hood in Oregon. There is quite a bit of history in the area, starting with the lodge that was built during the Great Depression by a master craftsman. The Timberline Lodge also has a bit of more recent history attached to it. Part of the movie, The Shining, was filmed here. Many of the ‘outside’ shots were done at Timberline Lodge. The lodge is entirely hand made, and well preserved. The hand woven draperies and the hand hewn beams add to the rustic charm and history of the place. The lodge sits in the middle of 1400 acres consisting of 35 trails. The trails are perfect for beginners, intermediates, and experts. The top elevation at Timberline Lodge is 8504 with a vertical drop of 2501. There are six chair lifts to accommodate skiers. One of the most unique things about Timberline is that it is the one place in the United States that offers year-round snow skiing. Palmer Snowfield is part of the Timberline Resort, and it is permanently covered with snow. Beginners are not always allowed on Palmer snowfield – the conditions are considered each day when making this determination. Skiing, snowboarding, hiking, snowshoeing, and lodge tours are the main attractions at Timberline. Here, it is all about the powder! Mt. Hood is an active volcano which is considered to be dormant. Occasionally, tremors are felt, and steam vents are often visible. The Cascade Dining Room is open for breakfast, lunch, and dinner each day, but the hours do change with the seasons. Other fare can be found at the Ram’s Head Bar, the Blue Ox bar, the Wy’East Kitchen Cafeteria, the Market Café, and the Mt. Hood Brewing Company. Rental equipment is not available at Timberline. You must bring your own equipment. However, smaller items such as gloves and goggles can be purchased at the lodge, along with some clothing items. There is a snowboard and ski school on the premises, and private and group lessons are available. If the idea of a ‘rustic’ ski vacation appeals to you, as opposed to trips with accommodations that are a bit fancier, then Timberline Lodge in Oregon is the place to be! Again, it is definitely all about the history and the powder here. However, whether you ski or not, you must not miss the Magic Mile, which offers a panoramic view of the Cascade mountains that cannot be matched!